Sunday was Friend Sunday at our church. We were all charged with inviting as many friends as possible. It was a blessing to see such a nice crowd in the sanctuary. My song choices were: What a Friend We Have in Jesus; Jesus, Hold My Hand; Just a Little Talk With Jesus; and 'Tis So Sweet to Trust in Jesus. Jesus, Hold My Hand and Just a Little Talk With Jesus are two of my favorites. On the chorus' each vocal part sings completely different lyrics that mesh together in a wonderfully complex way that new songs don't come close to touching. After church, we all went over to the gym for a picnic. I had the idea to buy the 6 foot subs from Walmart and that ended up being what they did. The highlight of the day came in the gym. 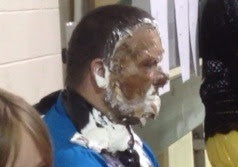 If we could get 25 visitors, Timmy (our pastor) would get a pie in the face! The person with the most guests would he to throw it. It turns out that Timmy himself had the most guests, but, being a good sport, he let one of the kids (who won a memory verse game at the picnic) throw it. I should mention that Tristan didn't care much for His buddy Timmy getting the pie in his face. He told me, "Timmy get a pie in his face. It get in his eyes. It get in his nose. It get on his shoes." He mentions it every time we go over to church or talk about church or Timmy.